Were Dark Forces Behind the Dragons' Magical Championship? I've been covering this team day-to-day for almost twenty years now, this sport for my entire post-graduation career, and I've been a fan my whole life. Believe me when I say that I've never seen anything like it before. Not even close. The Dragons were a team that seemed fated to win that year. Destiny. That word gets thrown around from time to time in pro sports. A series of lucky breaks seem to go a team's way over the course of a series, or a month, or even a full season. Every champion needs a lucky bounce every now and then. Occasionally, a team will seem to ride that luck for a full campaign, as if the universe itself—or some force in it—has pre-ordained them to be champions. The Dragons that season were like that, only to the nth degree. Like I said, I've never seen anything like it, before or since. Mostly, it was ordinary little things. A game-winning home run, a timely strikeout, an easy ball mishandled by an opponent. These are normal things you see over the course of a season; however, that season, it seemed to be happening nearly every night. A dangerous ball down the line would land just foul if hit by an opponent; if it was off the bat of a Dragon hitter, then it would kick up just a hint of chalk, landing in play. A Dragon pitcher, clearly gassed and throwing duds on the mound, would suddenly find a break in his slider so wicked, the opposing batter would swing himself onto the seat of his pants in the dirt at home plate. An easy popfly to end a Dragon rally would suddenly get lost in the sun by the fielder, drop onto the turf, and extend the inning. Over and over, all season long. Nothing crazy, nothing unbelievable; but the sheer volume of moments added up to a team of destiny. Everyone felt it. By the end of the season, they seemed fated to win it all. And as they began their run through the playoffs, it became more and more likely that the Dragons would be ending one of the longest championship droughts in both professional and semi-professional sports history. It had been more than a century—the club's entire history—and the Dragons had never won it all. Yet despite more lucky bounces, timely hits, and every close call seemingly going their way, the Dragons found themselves in the heat of a deciding Game Seven in the final series. The championship was on the line and the Dragons were down to their last half-inning. Their final at bat. Bottom of the ninth, down by one run to the defending champion Cougars. One out, with a runner—Kyle Kofax, the Dragons' speedy centerfielder—at first base. Two outs away from their season being over. Two outs away from destiny being denied, their luck run dry at the most inopportune of times. And then Francisco Garza hit a lazy bouncer right to the shortstop. "You saw the video. You tell me what the hell happened." It was an easy double-play ball. Even the speed of Kofax at first wouldn't be enough. A flip to the second baseman, over to first, and that was all she wrote. Season over. Another year added to the championship-less streak. So much for destiny. Except the shortstop never managed to get the ball to the second baseman. Years later, the shortstop, Phil Rogers, would insist that he simply mishandled the ball. The blood all over his hand and his glove he would explain away as a freak occurrence—the bouncing ball having caught him just right, splitting the webbing between fingers. Even when video of the play clearly showed him fielding the bouncer with his glove, securing it, and then reaching in with his bare hand, preparing to flip it on to the second baseman. Not to mention that immediately after the game, eyes wide, hand wrapped in a bloody towel, he claimed that something had bitten him. "The ball?" asked a reporter, drawing laughter from those nearby. Whatever actually happened to cause Rogers to drop the ball, what occurred next was even more bizarre. The ball dropped at his feet, bouncing back between his legs. Rogers turned, reached down to scoop up the ball. And missed. His fingers closed over the spot where the ball should have been, but it wasn't there. Still bouncing, the ball suddenly changed direction and rolled towards the outfield grass, as though propelled by some unseen force. As if Rogers had mistakenly booted it, although footage showed that he clearly hadn't. "Guess it just took a wicked bounce," he said in the weeks following the game, shrugging. He didn't sound like he believed it. Replays showed the ball impossibly changing direction in mid-air, moving laterally as if dodging Rogers's outstretched fingers. Upon landing on the dirt, the ball proceeded to roll—with purpose, some people claimed—away from the fielder and towards the outfield. Rogers reach for the dropped ball put him off balance and he crashed to the dirt. He crawled after the ball on his hands and knees, still grasping after it. The ball—by some accounts, consciously—scooted farther away from him, rolling with more energy than seemed possible, all the way to the grass. By this time, speedy Kyle Kofax had reached second, and seeing the loose ball and struggling fielder, turned towards third base and accelerated. Rogers, the shortstop, was in his path. For a moment, everyone held their collective breath as Kofax hurdled the player. Was he going to clear him? Then, as if some invisible hand upon his back had pushed him to the ground, Rogers collapsed flat onto his stomach, whereupon he placed his glove over his head and gave up on the play. Kofax sailed over him. Landed, legs pumping. Continued towards third. Still, the play should have ended then, with Dragons on the corners and one out. Ahead by one run, the Cougars might have found a way to hold on for the win and the championship. But that wasn't the end of the play. Jared Albertson, the Cougars' third basemen, moving across the dirt behind Rogers to back him up, was close enough to run over and grab the loose ball. He bent down, fielded it with his glove. And the strangeness continued. As Albertson straightened up, eyes focused towards third base where Kofax was sliding in safely, the ball in his glove suddenly bounced up. An incredible time to lose control and juggle the ball! Except Albertson claimed the ball "jumped". By itself. To this day, he maintains that he didn't juggle it, didn't mishandle it. It jumped out of his glove. And right at his face. Stunned, the Cougars' third baseman crumpled to the ground. The ball bounced farther onto the outfield grass. Albertson, his nose bloodied, leapt up and went after the ball. Kofax, brushing himself off at third base, took one look at the loose, bouncing ball, and dashed towards home. He was the tying run. By this time, Garza, the batter, was rounding first and digging for second. Luke Pierre, the Cougars' second baseman, was still covering the bag, incredulously watching his teammates knock the ball around like little leaguers. To this day Pierre won't talk about the play or what he saw from his position at second base. The crowd was up on their collective feet, yelling and cheering, sensing something mythical and magical was taking place. Their beloved Dragons, who had been carried through the whole season on the wings of fate and destiny, were being swept towards the end of a bitter, century-long curse; they were hurtling towards their long-coveted championship. Albertson dove for the ball, missed (did the ball turn away from his hand?) and banged the ground in frustration. He picked himself up, ran after the (still) rolling ball, and somehow managed to boot the thing deeper into left field. Kofax crossed home plate, tying the game. The crowd roared, even as the left fielder for the Cougars, Dave Wilson, rushed forward to collect the ball. Albertson continued his pursuit and together the two fielders warily closed the distance, trapping the ball between them. Ignoring good sense as well as his third base coach who was showing him the stop sign, Francisco Garza, the Dragon batter, rounded second and dug for third. All that either Wilson or Albertson needed to do was pick up the ball and throw Garza out at third, where the Cougars' pitcher was now covering. Except the ball seemed to have other plans. While the two Cougars tried to grab it, the ball bounced and darted and zipped between them. Off fingertips, off shins, off knees and gloves and shoulders. Finally, Albertson got a hold of it . . . only to see the ball squirt from his grasp, bounce off Wilson's head, and bound away from the pair. Garza glanced over his shoulder, ran past the dazed Cougar pitcher, and headed for home. The coach stationed at third base—too shocked by the events he was witnessing—wasn't even waving him home. Instead, the coach held his head with his hands, watching the play unfold. His mouth hung open in disbelief. In the outfield, Dave Wilson at last managed to pick up the baseball. Turning towards the infield, he wound up and prepared to fire a rocket throw towards his catcher. There was still a chance to get Garza out at home plate. Video footage showed that Wilson dropped the ball suddenly, grimacing. As the ball landed at his feet, the left fielder shook his bare hand, face pained. He, too, would claim immediately after the game that he had been bitten by "something". "I don't know what," he responded curtly towards a follow-up question. "You saw the video. You tell me what the hell happened." Analysis of the available camera angles by amateurs on the internet seemed to show something without explanation. Something impossible. Many others, myself included, contend that the videos show only distortion caused by attempts to zoom in and slow down the footage. However, the conviction of the believers is unshakable. They claim that the baseball in the available videos can clearly be seen chomping down on Wilson's fingers. 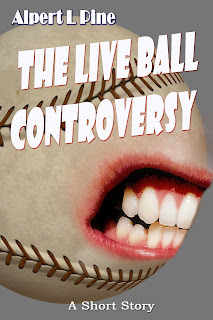 That there is a mouth on the baseball, a mouth filled with rows of teeth. That the baseball is not a baseball at all, but some sort of living creature. Setting aside the wild supernatural theories that arose based upon the supposed nature of a few pixels in the available online videos, there remains the simple fact that everyone watching in the stadium that day and at home on their televisions were witnesses to one of the strangest and most dramatic plays in the history of semi-professional baseball. Francisco Garza crossed home plate and the Dragons won the game. Everything else about the play might remain open for debate to this day, but not that. Not the final score. And after enduring over one hundred years without a championship, after endless talk about a curse upon the team, after near glories and bitter defeats throughout the preceding decades, at last the Dragons were able to call themselves champions. So, are the fabled sports curses real? One thinks immediately of the Red Sox, the Cubs, the New York Rangers, and many other sports teams throughout the years, whom have at one time or another been thought cursed. A bad trade. A greedy owner. A jilted former hero. There are all manner of potential incidents that the fans will point to, trying to find something to blame the failures of their team on. And after a while, maybe it becomes more than a bad run. An unlucky losing streak. Maybe it does become a psychological barrier to success, an expectation for disaster that feeds on itself and begins to manifest results that give the appearance of a team cursed. So what is the truth in the case of the Dragons? Was it a losing streak? Was it a curse? Were dark forces at work, keeping the team from reaching a title for over one hundred years? And were similar dark magics used to defeat that curse? "The price of this deal . . . was that Mason would get his precious championship, and in exchange, the team would be sold . . ."
In the aftermath of that final game, with replays of The Live Ball Play appearing all over the news and internet, rumors began to fly. One of the most persistent: Daniel Mason, owner of the team, had suddenly and inexplicably gone blind before the start of the season. It's a fact that he began appearing in public always wearing a pair of shaded glasses. However, throughout the season, he was firmly tight-lipped regarding his vision, never commenting upon or answering questions regarding his sight. Then, less than a week after the victory, his oldest son, Daniel Jr., was killed in a light aircraft accident. Before the following spring, Mason had sold the Dragons to a mysterious and reclusive billionaire from Lebanon, Abdul-Zaman Khouri. Days after the sale, Mason's vision was said to have returned, reportedly leaving his doctors baffled. He no longer wears the dark glasses, which he was so often seen and photographed wearing during the magical championship season. Did the Dragons' owner, Daniel Mason, make some sort of supernatural deal? Enlist some manner of magic to combat the negative energy of the Dragons' curse? Was the price of that curse-removal the sale of his beloved Dragons to the strange Lebanese businessman, Abdul-Zaman Khouri? Was Mason's son, Daniel Jr., part of the price of that championship? One popular online theory to explain the circumstances of that magical year suggests that Mason made a deal with Khouri, whom either had the power himself or had access to those who could, by supernatural means, bring a championship to the Dragons. The price of this deal, according to the theorists, was that Mason would get his precious championship and in exchange, the team would be sold to Khouri after the season. Theorists further surmise that Mason's vision was a sort of collateral used in the deal. A cruel twist, when you realize that Mason got his championship season, but was unable to actually witness it! Perhaps afterwards, Mason grew reluctant to sell the team that had been in his family for three generations. The price of breaking the deal (say the theorists) was his son's life. Heartbroken and beaten, Mason eventually finalized the sale of the Dragons to Khouri. At which point, as per the agreement, his eyesight was returned. Of course, all of that is merely one possible explanation for the strange events surrounding the Dragons' marvelous, magical championship season. It's simply speculation. Wild speculation, some would say. However, the play that earned them that championship, the Live Ball Play, is a matter of video record, even if debate continues about precisely what the video shows. We may never know the truth of exactly what occurred that day, when the Dragons defeated the Cougars in one of the most talked about and analyzed moments in sports history. But then, isn't that better? Not knowing? After all, if the truth were known, what would be left for us to discuss? This story will remain free to read for the entire month. If you enjoyed this story, please consider supporting me by purchasing an electronic copy for just 99 cents or buying my short story collection, It's Always The Apocalypse Somewhere, from which this story is taken. Also be sure to check out my other published books and stories. Thank you so much!